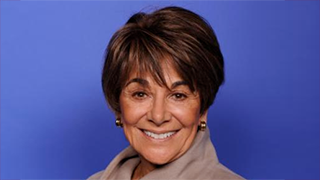 Congresswoman Anna Eshoo addresses cuts to Social Security and Medicare. Congresswoman Eshoo answers a question about NIH Funding. Congresswoman Eshoo discusses the high cost of prescription drugs. Congresswoman Anna Eshoo hosted this Access Live event for constituents in the 18th Congressional District of California. The congresswoman opened the event by discussing ongoing work in Congress such as building a wall, and protecting Social Security and Medicare. Congresswoman Eshoo also spoke about the Mueller report, provided clarification regarding the Green New Deal, and expanded on her efforts to maintain bipartisanship in Congress.